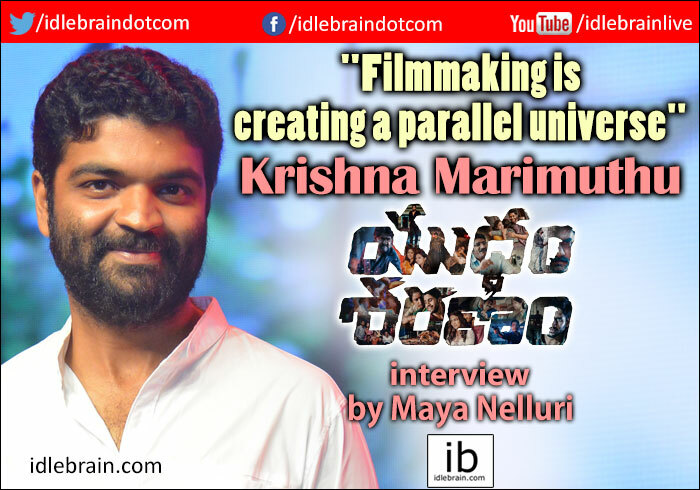 Yuddham Sharanam's debut director Krishna Marimuthu shares with us his experiences while working on the film in this freewheeling chat. He also opens up about his friendships with the hero - Naga Chaitanya, and music director - Vivek Sagar. Read on. The title of the film is a mix of two polar opposite words. Can you tell us about why you decided on that name? There are a various dimensions to this film. If we were to concentrate on the beautiful track of the hero's life we would have one name. If we focused on the villian's side there would be another name but I wanted to capture the emotion of the entire film. The 'yuddham' part of the title has attracted the most attention because it is such a powerful, aggressive word. One tends to think the movie is about all out war because of that. But my justification for the title lies more in the second word 'sharanam'. It means to bow or seek refuge. The film isn't about an individual whose life is about fighting, it is about a normal man who is forced into a corner and the only way out is to fight back. It's a situation where the only way he can take refuge is by waging war. Tell us a little bit more about the storyline of Yuddham Sharanam. It deals with multiple tracks, one is of a very powerful criminal with destructive motives that the police are trying to capture; another track deals with a normal man living with his loving family. But one incident brings everything to a headlock. We all have our own idea of what our world is. This movie deals with how one reacts when that idea is challenged by unique situations. We've taken a very realistic approach to the film and characters. You will see when the story unfolds that we have brought out each character's strengths and weaknesses as they would have come out in real life. How was it directing this story? When I first heard the story I was imagining the amount of work involved for the director. It's because the story has so many dimensions; there is the crime aspect, then a beautiful family life and so on. While we were shooting we actually went through all the dimensions as well. When we shot the family life we felt like part of the family and we didn't want to leave the house. And when the two worlds collided we shot in extremely taxing situations so we felt the mood of the story while shooting. I thoroughly enjoyed every part of the filming and am confident that it's come out well. We can see that in the movie an instance transforms the hero; was any of it inspired from your life? It isn't based on my personal life but the setting of the hero's family was inspired by my own. The rest of the story is a 'what if' scenario. What happens when someone is pushed in to a corner? In our films we usually see a hero who is well equipped for combat but in this film we have shown what an everyday person is capable of doing for survival. Imagine if today you find out that your world as you know it is shattered; what will u do? In my life many of my days are spent at home, maybe watching TV with my family, waiting for my sister to come back home. I wanted to show the beauty of the normal family life that I've experienced. My life helped me shape the characters of the mother, father, sister and the girl he likes. I tried to imagine what would happen if thats taken away from me. The rest is completely fictionalised from a 'what if something went wrong' perspective. You have a previous association with the hero of the film - Naga Chaitanya. Is that because you are also from a film background? No I'm the first person from my family to enter films. Me and Naga Chaitanya went to school together since fourth grade. We were actually born on the same day and did a lot of things together whether it be sports or other activities. We developed an innate partnership irrespective of what we did back then. We even formed a band in ninth standard and wanted to make it as a rock band! Eventually when he moved to Hyderabad and I started writing. There was a particular time period in my life around my first and second years of college that I moved away from hero worship and realised the importance of the men behind movies. I started watching Mani Ratnam sir and RGV sir's movies. I was still in Chennai then but later moved and assisted Krish and A.L.Vijay. And Naga Chaitanya started rising up the charts by then. Once he saw that I was putting things together he wanted to restart our partnership. And we started bouncing ideas off each other from then. When a writer named David came with this story we thought it would be the perfect script. You are also a musician so how did that affect your filmmaking process? For me everything stems from music. Music opened my world to everything. Once I hear something, visualisation automatically happens in my head. And putting another parallel universe together, which is what filmmaking is, excited me a lot. I've always been curious about human behavior and I have a habit of trying to predict what people will do. I'm interested in understanding behavior and putting a character together more than the twists and turns in a movie. To me getting the identy of the character right is of supreme importance and I enjoy that process a lot. In this movie, the script was good and I used my strengths to define the characters and character relations to further tweek it. I imbedded a lot of myself into the story. Tell us about the music aspect of Yuddham Sharanam. Me and the music director Vivek Sagar go back ten years. We met in Durgam Cheruvu back then when I came for a gig. After that we lost touch, and I went on to do chartered accountancy before finding my way back to films and Hyderabad. Just during Pelli Choopulu we met again and had a 'hey what are you doing here?' moment. That's when we decided to work together. We've since spent a lot of time putting the music of this film together. Since all three of us, including Naga Chaitanya come from a music background we were very particular about putting something together that we can be proud of. I used to wonder how the music would be for my film but I'm extremely pleased with the result now. Vivek totally owned it and did a great job. The musical narrative was perfect for each and every character. I also have to add that on the technician side the production really gave me a free hand. Everyone from costumes, art direction, music to cinematography did an amazing job. What you will see on screen is their understanding of the subject and classic execution of it. You started off as a writer; did that help with direction? I believe that 90% of visualisation comes from writing. On screen it's about getting people together and allowing technicians to bring to life what you've imagined. As a director the way I narrate the scene inspires everything. Be it a DOP or costume designer, all departments depend on the script, what we put on paper, to bring out their creativity. Direction is essentially putting everything together and making the important decisions. For example as a director I might decide to move the location to include moving vehicles to make the scene more dynamic. But the content is in the writing part; all those knots happen on paper. Paper is the real hero! Coming to the negative protagonist in the film, Srikanth is a veteran in the industry. How did you show him differently? I'm from Tamil background so I hadn't watched too many Telugu films of his. I knew that he is a big hero and that he was introduced as villain early on in his career. He even has some very reputed negative roles to his credit. And I knew that as a lead he is seen more as a family hero. But because of my background I didn't have any preconditioned notions about him. He took the role beyond what I imagined. He is a towering personality in the film and he us definitely shown very differently in this film. Being a great performer he understood the role and brought to it the perfect amount of aggression that I had planned for his role. He actually took a lot of pain putting the character together. He did a lot of research and during the shoot he would use ten drops of gliserine because we wanted his eyes to be red.